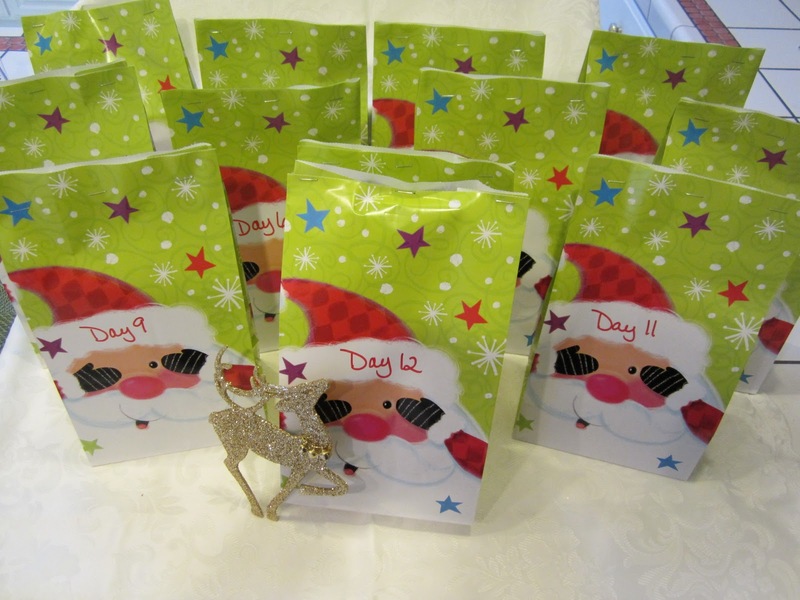 Here are my 12 Days of Christmas gifts that are going to my friend Stella. She graciously granted me a bit of an extension on getting them to her (we were supposed to ship them by Nov. 10). I shipped out gifts to Diane in Florida who is my other recipient by the deadline but was working on something special for Stella and just couldn't get it done before my trip to Bodega Bay. We were supposed to meet last night so I could give them to her (and celebrate her birthday) but we both have colds and decided it was best to put it off until next week. So Stella is still waiting for these goodies! I love these little bags which I found at CVS Pharmacy - the "No Peeking" Santa works perfectly for this swap. And how about that ornament? I saw that and immediately thought of Dasher - Stampin' Up! 's resident reindeer. I couldn't pass up including that in with her gifts. Keep checking my blog as I post the gifts I receive as well as the gifts I made. I will be posting the gifts I made on the weekends. Hope everyone is having a wonderful Holiday Season -- Happy Shopping! Of course, you can do your Stampin' Up! shopping right here from my blog. Just click on the Shop Now! button and order all kinds of Stampin' Up! goodies for Christmas. If there are things that you want, just direct your friends and family to my demonstrator website and they can order for you in time for Christmas!